This is the instantly downloadable 201 page body sculpting manual. The same book that is literally changing the lives of hundreds of skinny, average and chubby guys and gals. The book that promises to build natural mass in the shortest time possible! As the title suggests, "No Nonsense" gets right down to it. It is not just another e-book with a bunch of boring pages that you won't even finish reading. It's actually the opposite! It is direct and to the point, but is packed with the most comprehensive system I've ever seen! 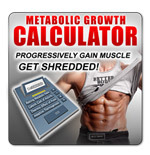 It will empower you with every tool required to short-cut your success to insane muscle gain! No fluff. No B.S. 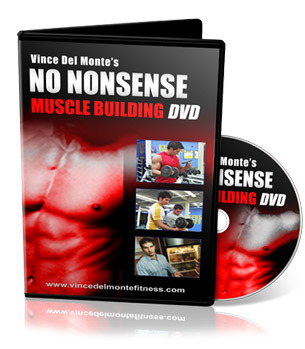 No hype!It's designed for one thing and one thing only… to show you the most direct and uncomplicated methods to building more muscle mass and gaining weight. Quickly and easily. Trust me, no one has worse genetics (for building muscle) than a long-distance runner who ran 80-120 km a week for 10 years…so if you think you have bad genetics - throw that excuse out the window! Whether you are an aspiring bodybuilder, fitness model, competitive athlete or just want to look good in a bathing suit - this system has been proven to work time and time again! You get exclusive access to a secret website that gives you insider information to skyrocket your success. 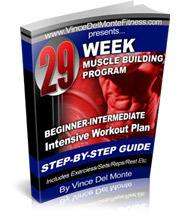 You get to begin with Vince DelMonte's Beginner-Intermediate Intensive 29 week program in its entirety. This first 29 weeks is the exact way I trained when I gained 41 lbs of muscle in six months. You get access to an entire years worth of workouts which leaves you with zero guesswork and a years worth of injury free workouts. 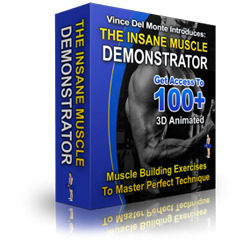 3-D animated pictures of each exercise so you can see exactly how to do the exercise properly. Verbal exercise descriptions that reinforce the animations so you can't make a mistake! Program details for each workout i.e. sets, reps, rest, tempo. Forget the guesswork of other systems. Vince lays it all out there! Special tips and advice for each workout. This is especially important because you get extra advice right from Vince! Built-in-calender to keep you on target to meet your goals! Log book for you track and for me to monitor your workouts. And a private members only forum to chat with your fellow trainees, ask questions and talk to your coach. So you already have a few years of solid training under your belt? For those who consider them self an advanced trainer then consider this a once in a lifetime opportunity. …this killer 29 week max-power bad boy has got your name written all over it! Everything is explained in explicit detail to ensure maximum effectiveness! Warning:This program was specifically designed to take you WAY outside of your comfort zone and take your muscularity to an entire new level. If you end up in the washroom after the first 15 minutes- don't be hard on yourself. You get exclusive access to the same secret website that gives you additional insider information to skyrocket your success. completely unique preparation program to GUARANTEE and jump start your success…"
Whatever the case, I have created a completely unique introductory kick start program called Upside Down Training. Can you believe that the majority of testimonials you read on this page are from people who are only in the INTRODUCTORY phase!!! Postural Imbalances - Most programs online assume your body is in perfect alignment. Training with nil posture is like taking a misaligned car out onto a long road trip. Guess what's going to happen when you start pushing it? It's going to break down! UDT focuses on the exact exercises you should do and which ones you should avoid at all costs. UDT training will make you look bigger simply by correcting your poor posture! Shoulder Stability - Most guys have no idea that they are causing more harm than good but will find out in 10 years from now when they get hurt and start paying for a therapists next vacation. UDT will ensure your shoulders stay healthy for a lifetime. Core Stability - You think shoulders injuries are bad? Not a chance compared to lower back ones! Anybody with a low back injury would not wish it upon their worst enemy. UDT will build up the strongest core muscles that Bruce Lee couldn't even penetrate. Upper Body and Lower Body Flexibility Training - if your as stiff as a board then your body is SCREAMING for an injury. No other online course offers an entire years worth of stretching programs to ensure your body is ready to train hard without injury. Specialization Training On Lagging Body Parts - You know your only as strong as your weakest link right? So how the heck are you going to build your chest, back, shoulders and legs if your smaller muscle groups are lagging? UDT tells you exactly what exercises to do to ensure you have no limiting muscle groups. Bodyweight Conditioning Program - Jealous of how those guys looked in the movie 300? Not only were they ripped and muscular but they were incredibly fit! Just because you want to bulk up and build muscle does not mean you have to sacrifice your heart and lung strength too! UDT will share some killer bodyweight conditioning workouts to ensure your muscularity matches your fitness level too. You truly have no other option but to succeed when you kick off your program with a completely individualized program to eliminate any potential injuries and lay a rock solid foundation to jump start your muscle growth. As you can see, Upside Down Training should be a product by itself. This site is actually in the works and will probably be sold for $47-67 once it's released so don't procrastinate. All I can say is this is worth more than the crazy low price of the entire program. Eat more, eat more, eat more! I am sure you have heard it a thousand times before. But nobody has shown you exactly what to eat and in what amounts! After you have access to these meal plans you will no longer have any excuse for not gaining muscle. Print them off and put them in your kitchen. Finally…no more guesswork. 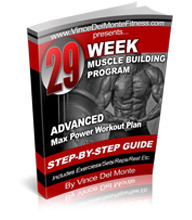 Just follow the plans and gain mass muscle! Other websites offer basic 30 days meal plans, but you're getting 5 unique 84 day meal plans with a variety of food. That's 12 full weeks of no-guesswork, real… healthy eating. Now you don't have to worry that bulking up means eating fatty foods. These plans range from 2,000 calories to a massive 6,000! Yes… 6,000 calories of healthy eating. You are in complete control of how much muscle you gain! Can you imagine how huge you will be when you build to the 6000 calorie meal plan! And no one has these meal plans ANYWHERE. I know this because well… plans like this are not cheap to have made. I'm able to offer them because well…Don't tell anyone, but the guy who owns the nutrition company… He's my workout partner! Shhhhhhh. Separately they'd cost you $235.00 for an entire set. You will build 5-10 lbs of clean, lean muscle weight in the next 4 weeks guaranteed! Grocery lists are included for each week. Vince shows you exactly what you need to buy… and what you don't. Saves you time and money! Meal preparation strategies included. Not much of a cook? That doesn't matter, because Vince shows you exactly what to do! Absolutely no guess work! Hey… you want to build your muscles… You're not looking for something complicated! Vince makes easy! And the answer is "Yes!" You can even use my program at home even if you only have the bare minimum exercise equipment…I got you covered! The Insane Virtual Exercise Demonstrator includes every exercise necessary to complete my Intensive 52-week program properly. Workout out at home, at your school, at your college gym or in a fancy super sized club…every exercise you need is included. Even if you are a beginner, a young guy or can't afford to get a personal trainer to show you how to execute each exercise safely - the demonstrator will show you how to do each exercise properly. You'll even get a mini anatomy lesson since all these exercises are conveniently organized by muscle groups and movement patterns. Say goodbye to injuries and say hello to max- power workouts! Either you don't have the time or don't have a clue on how to calculate your resting metabolic rate, caloric cost of activity, thermic effect of food and adaptive thermogenesis. Did I lose you? Getting massive (or getting lean for that matter) are based on understanding the exact amount of calories you actually need. Sadly, most people royally screw this up! You no longer need to navigate through the harsh jungle of energy balance equations. 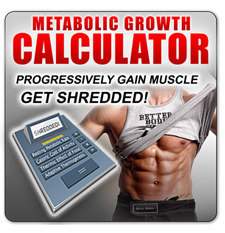 Just enter your details and my "Metabolic Growth Calculator" will do the rest. Simply tell it if you want to "progressively gain muscle without getting a pot belly," or "gain weight fast at no cost," or "get shredded." I have everyone of these formulas already calculated for you. I consulted the top exercise nutritionist in the world to create this incredible time saver personally for you! This is the list that is rumored to be on the desk of every muscle magazine editor. They're scared because I'm not only blowing the lid off all the bad supplements they're hawking, but I'm pointing out the truly useful ones, that in most cases they have nothing to do with. I have to tell you, it was not easy to get this list. I actually contacted seven recognized scientific authorities to get a complete list of over 500 different nutritional products on the market today! I almost punched the wall when I found out the supplements I used to be using only had a 3.4% absorption rate (which I was paying almost $100 a month for)!!! I couldn't keep this information to myself so I have compiled a list of the best nutritionals (even exact brands) ranked by independent researchers that were rated based on absorption, potency and quality. This information can save you hundreds of dollars this year alone! The audio report that gives you all the ammunition to sidestep the mistakes everyone else is making in the gym. …not even the Pope will be able to forgive you for the ones you are about to discover! Save yourself time… save yourself injuries… save yourself embarrassment… save yourself a trip to the confessional stand! Burn it to a CD or stuff it into your iPod, because you don't want to be at the gym without it. Your Instant 24/7 Fitness Coach! Can you imagine having access to your own fitness coach - the guy who wrote your program - at any minute of the day? The fact is that your going to have questions about any new program you start no matter how nicely it's laid out. That's normal but what if you need answers NOW? Instant 24/7 Fitness Coach is an accumulation of every single question I have ever been asked since the release of this program. You need answers to the training program? Questions about the meal plans? Supplementation? Stretching? Injuries? 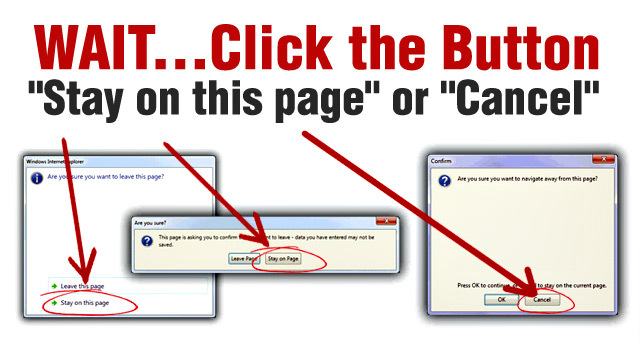 Simply look up your question and within less than 20 seconds you will get an instant answer. No waiting whatsoever. 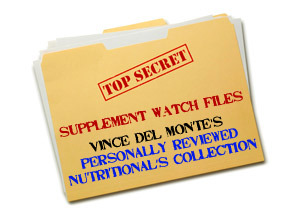 If I don't have your answer in my database- just email Vince - and he'll reply personally and add it to this priceless vault! 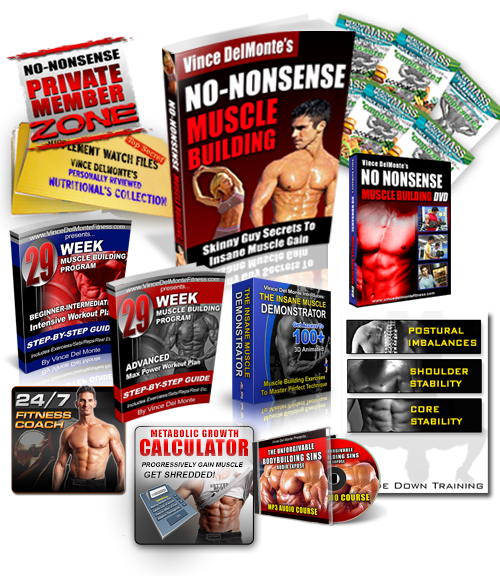 Currently this is the third version of No-Nonsense Muscle Building and the Hardgainers Success Kit. I said i would make it better and i did. I believe in constant and never ending improvement. You will never need to surf the Internet ever again. This is your last stop for information! Once you come on board I will be with you for the long term in continuing to make this program better, more complete and easier to follow. I'm dedicated to make sure you'll never be "out of the loop." Remain well armed with up to date info in every part of this package! Whether updates are made in 6 months, a year of even 20 years from one… it's still free for you. Until I get this package absolutely 100% perfect… you get updated. Press the "Play" Button To Start The Video. Finally, after a year in the making, this 4 hour DVD has arrived. You get to see what makes this program so great - LIVE in action. This is the Vince DelMonte like you've always wanted to see - huge, ripped and stronger than hell! In this inspirational, educational and entertaining DVD, Vince will take you through his own personal kitchen, fridge and cupboards. You'll see him blast through his warm up, weight training workout, stretching routine and cardio program. Every raw detail of his book is explained so that you can build your own awesome physique. By the end of the 4 hours, you'll have seen Vince tear through every single exercise in his program so you have no excuse to perform the program incorrectly. The hardest thing about watching this DVD is having to wait til it's over to run to the gym and bust out some serious lifting! I will eventually be charging $9.95 to $19.95 a month to get access to this private member zone but currently you get LIFETIME access, absolutely FREE. 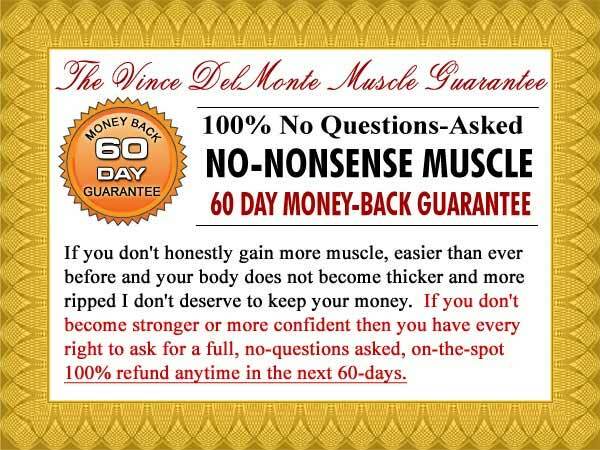 Vince, I'm ready to finally pack on solid muscle, force my body into massive growth, and do it WITHOUT bodybuilding drugs, WITHOUT worthless supplements, and WITHOUT delay! The top-selling fast muscle 201 page manual that is literally changing lives! The entire step-by-step workout routine. Achieve the perfect workout, without all the guess work! 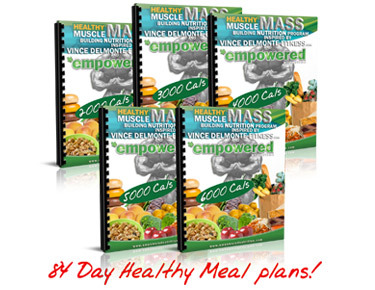 Five 84 Day Healthy Mass Meal Plans. Eat to grow huge! Every exercise to work out in your home with limited equipment or in a fancy commercial gym…I got you covered. No more navigating through the harsh jungle of energy balance equations! Never get scammed by the supplement mafia again! I'll tell you what to use and what to leave on the shelf for the next sucker. You'll never be "out of the loop." You'll always be well armed with up to date info! Unlike phony marketers posing as trainers, you get to see me work up a heck of a sweat taking you through the entire program step-by-step. You won't get this with any other program anywhere. You're too smart to waste your money on surgery and ego-filled personal trainers who don't know my system. You're no longer going to waste your money on powders, liquids and pills. And as for the over-hyped, over-priced competition on the web? Come on… you're smarter than that. You're here now and that's the best thing you could have done. Because… you're not even going to pay anything close to the $1069.00 value of this program. By acting right now, you get my entire "Success Kit" for the introductory price of only… $127 $77.00!! That's $992.00 off this already amazing value! At that price, you can't afford NOT to sign up right now! And I'm not kidding when I say this price will definitely not last forever! Your Future Is Right Here!